Biotinylated Human ITGAV & ITGB5 Heterodimer Protein (IT5-H82Wa) is expressed from human 293 cells (HEK293). It contains AA Phe 31 - Val 992 (ITGAV) & Gly 24 - Asn 719 (ITGB5) (Accession # NP_002201.1 (ITGAV) & P18084-1 (ITGB5)). 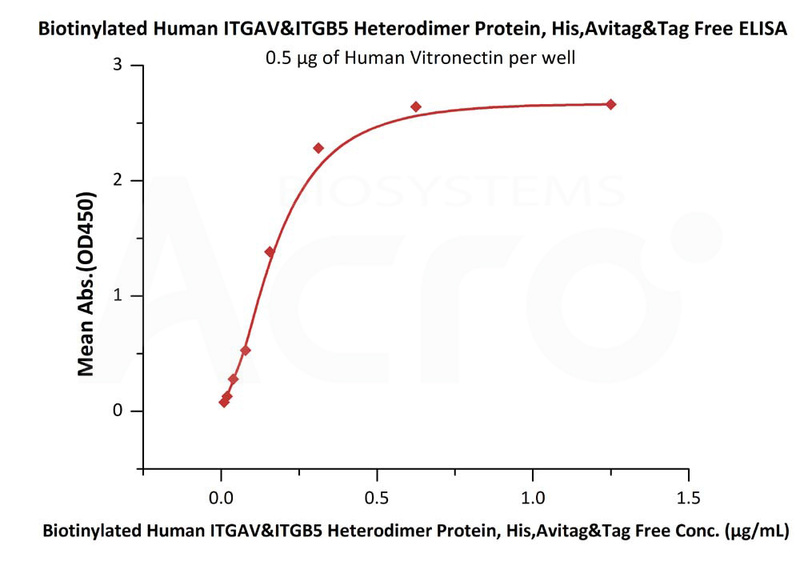 Biotinylated Human ITGAV & ITGB5 Heterodimer Protein, produced by co-expression of ITGAV and ITGB5, has a calculated MW of 114.7 kDa (ITGAV) and 81.9 kDa (ITGB5). Subunit ITGAV is fused with an acidic tail at the C-terminus and followed by a polyhistidine tag and an Avi tag (Avitag™) and subunit ITGB5 contains no tag but a basic tail at the C-terminus. The non-reducing (NR) protein migrates as 140-150 kDa (ITGAV) and 90-98 kDa (ITGB5) respectively due to glycosylation. 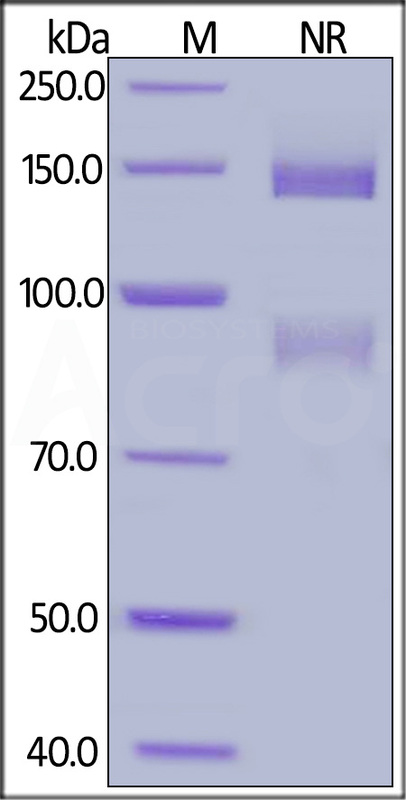 Biotinylated Human ITGAV & ITGB5 Heterodimer Protein on SDS-PAGE under non-reducing (NR) condition. The gel was stained overnight with Coomassie Blue. The purity of the protein is greater than 95%. Immobilized Human Vitronectin at 5 μg/mL (100 μL/well) can bind Biotinylated Human ITGAV & ITGB5 Heterodimer Protein (Cat. No. IT5-H82Wa) with a linear range of 0.01-0.156 μg/mL (QC tested). 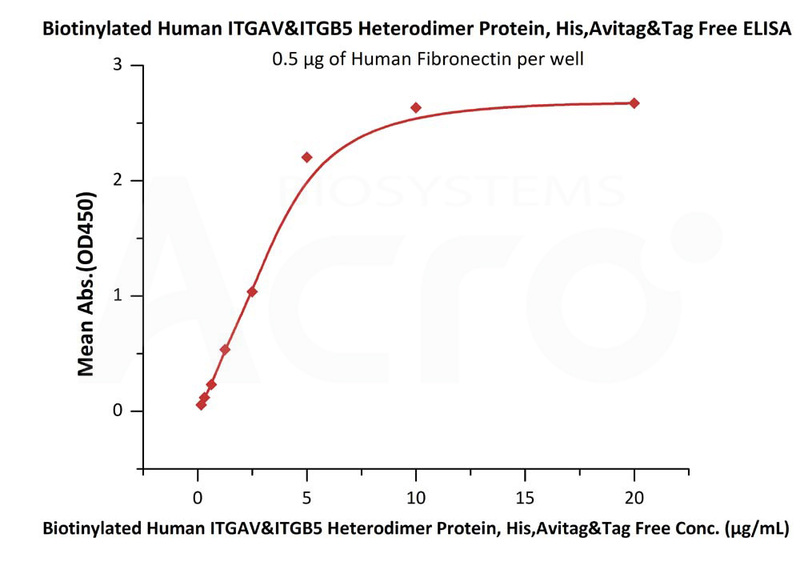 Immobilized Human Fibronectin at 5 μg/mL (100 μL/well) can bind Biotinylated Human ITGAV & ITGB5 Heterodimer Protein (Cat. No. IT5-H82Wa) with a linear range of 0.156-5 μg/mL (Routinely tested). Integrin alpha V beta 5 (ITGAV & ITGB5) is expressed on a wide variety of cell types including keratinocytes, fibroblasts, adhesive monocytes, embryonic stem cells, and select endothelium and epithelium. ITGAV & ITGB5 binds ligands containing an RGD motif, notably vitronectin. Growth factors that increase PKC activity, such as VEGF or TGF alpha, promote ITGAV & ITGB5-mediated angiogenesis while alpha V beta 3, which may be expressed in the same cell, responds to FGF-basic and TNF alpha. An inhibitor of both down regulates tumor angiogenesis. During lung inflammation, up regulation of ITGAV & ITGB5 on myofibroblasts or infiltrating lymphocytes may contribute to fibrosis by freeing TGF beta from latency. (1) Suzuki, S. et al., 1990,Proc. Natl. Acad. Sci. USA 87:5354-8. (2) Memmo, L.M. and P. McKeown-Longo, 1998, J. Cell Sci.111:425-33. (3) Desgrosellier, J.S. and D.A. Cheresh, 2010, Nat. Rev. Cancer 10:9-22. (4) Luzina, I.G. et al., 2009, Arthritis Rheum. 60:1530-9.